The Episcopal Church's largest event for high school youth is a triennial gathering called EYE (Episcopal Youth Event). On July 8, 2014, the Diocese of Hawai'i's delegation of twenty-four youth and five chaperones departed for Philadelphia, PA, where they spent the next few days together with over 1,100 fellow Episcopalians at Villanova University for EYE'14. Their days were filled with praise and worship, incredible speakers, workshops, and opportunities for fellowship with elaborately staged activities. Following EYE'14, the delegation continued on to the Episcopal Mission Center where they served the community in three days of urban mission. However, the journey to EYE'14 really began many months ago. Last November, the announcement went out and youth were encouraged to apply to be a part of the Hawai'i delegation that was limited to 24 youth. The final selection was announced in January, and included a well-rounded representation of youth from The Big Island (1), Kaua'i (6), Maui (6) and O'ahu (11). Although the Diocese contributed a portion of the cost for the trip, participants began fundraising in earnest to raise the $1,500 required from each person. The group from St. Elizabeth's in Honolulu held weekly fundraisers every Saturday for months, washing cars, recycling, and holding garage sales. On Maui, the two representatives from St. John's put on a special dinner concert, sharing their musical talents. The All Saints' group on Kaua'i hosted craft fairs, silent auctions, and ran various concessions. The day before the group departed, most of the delegation had a chance to meet up in Honolulu, where members of Epiphany hosted a farewell dinner and showered the youth with special handmade luggage tags, goody bags, and lots of love! Bishop Bob and wife Bea were on hand to meet with the group and impart well-wishes. Diocesan Youth Director and leader of the group, Sarah Kliztke, secured dozens of free Aloha shirts along with shell leis that the youth could wear and trade with others at the conference. As expected, it was a huge hit! At the first morning worship service with Presiding Bishop Katharine Jefferts Schori, the Hawai'i delegation got front row seats arranged by All Saints' youth member, Casey Nakamura, who was on the EYE'14 Design (Planning) Team. The Presiding Bishop's sermon addressed celebrating diversity and the call for equality, and Bronwyn Clark Skov, the Episcopal Church Youth Ministries Officer, talked about the Five Marks of Mission, tying in the theme for this year's event, Marked for Mission. The Hawai'i delegation sang the Doxology in Hawaiian as part of this first service---what an honor and what an experience! The rest of the EYE experience did not disappoint. The theme for this year's event was "Marked for Mission" with speakers inspiring their young audience through life experience, purpose and passion. Keynote speakers included The Rev. Canon Stephanie Spellers in the Opening Eucharist Sermon; Mike Angell, Episcopal Church Missioner for Young Adults and Campus Ministry; The Rev. Randy Callender with that just "GO!" attitude; Becca Stevens, founder of Thistle Farms with a moving and powerful presentation; and Bishop Michael Curry who brought the crowd to its feet with his energy and charisma during his sermon in the Closing Eucharist. Music was an important aspect of this event, and the group Live Hymnal from Florida provided a nice variety of traditional and contemporary songs throughout the event. The powerful and compelling St. Thomas Gospel Choir was a feature group along with the duo, Lost and Found, who brought humor and laughter to their music. There was a diverse mix of workshops that included faith formation, mission work, and thought provoking sessions dealing with forgiveness and stereotyping; contemporary issues such as LGBTQ Youth and slavery; fun topics with Lego building and Lent Madness; and even one called "Grill the PB", where folks got to ask the Presiding Bishop any question. Numerous activities were going on at any given time that included an open mic session where our own Chase Harrisson, Christy Fell, Mason Tabura and Viliamo Lino shared their musical skills. There were conga lines and games with giant inflatables, glow sticks and yummy late night snacks. But the more impressive activities included the bussing of over 1,000 people to different churches and historical sites around the city in a carefully choreographed timeline, and a rousing over-the-top event at the Philadelphia Museum of Art that would rival any celebrity bash. Atop the famous "Rocky steps" and fronting the museum entrance was a giant tent lined with food stations that offered up delicious local fare (including Philly Cheesesteaks of course), a DJ playing the latest sounds, and tours into the museum itself. After the excitement and energy of EYE'14, the focus turned to mission. The Hawai'i delegation was grouped with the Dioceses of Delaware, Fond du Lac, and Alaska (whom we adopted from the start), and was stationed at the Episcopal Mission Center/St Luke's in Germantown. We were graciously greeted and hosted by the center's young adults led by John Owens. Smaller groups were formed to serve at a soup kitchen, elderly center, farm, arboretum, food bank, and at the mission center itself, scraping, cleaning, painting, moving, lifting, weeding, chopping, planting, sorting and working with children. It was hard but rewarding work, and for some, was the most memorable part of the trip. The days began and ended with prayer in the beautiful St. Luke's Church. Between the four dioceses, there were three clergy in our midst that enabled us to hold Holy Eucharist on the final night of mission. I was very excited when Sarah asked me to help organize the trip and to be a chaperone. My experience at the previous EYE was such a positive one, that I looked forward to a similar experience and to witness our youth being transformed again. First-timers were again awed and no doubt deeply affected by what they experienced. Returnees, now three years older, brought a level of maturity to the group, and were more selective in their workshop selections. Villanova University was a large venue that presented some logistical challenges to the design team, but the overall result was nothing short of fabulous! The city of Philadelphia itself contains so much history, that planning the post portion was a wonderful opportunity for our youth to learn a great deal. Not only were they able to see the historical sights and sounds of Philadelphia, they got to visit museums, stroll the streets for a spooky "ghost" tour (that included the first Episcopal Bishop's haunted house), and even venture out to Lancaster to learn about the Amish and feast on Dutch cooking. Many thanks to Sarah and my fellow chaperones: Shana Ikeda, Viliami Lino, Rev. Ryan Newman, and to all the churches and their members for their support of our youth. We are especially grateful to Bishop Bob who has been unwavering in his support for our youth in the Diocese. Here's to EYE'17!!! Despite the fact that we got the hashtag #EYE14 trending on Twitter and that there are over 2,000 photos with that hashtag on Instagram, there is no way to document the effect that EYE had on the over 1,100 youth who came from all parts of the globe to participate in the event at Villanova University from July 8-12, 2014. It was an honor to serve on the team that planned this event, and I can honestly say that after 18 months of hard work, the event turned out better than we could have imagined. We began on Wednesday night with a carnival-style starter, “Oh Whudda Night”, Night of 1000 glowsticks, Frozen sing-along, and worship. Participants got to know one another by decorating diocesan flags that were hung around our worship space, played “people bingo”, did wacky wiggles, and had fun with over a dozen oversized balls and activities. They retired to their dorms after bedtime snacks of milk and cookies. As a member of the Program Team, this night was our responsibility. Seeing hundreds of people spread out over the field was absolutely amazing and a perfect kick-off to what turned out to be a transformative experience for everyone involved. Through group worship sessions, workshops, and plenary sessions, participants were able to meet people from all walks of the Episcopal Church and learn about aspects that were new and informative. We were honored to host amazing preachers like the Presiding Bishop Katherine Jefferts Schori, the Reverend Stephanie Spellers, President of the House of Deputies Gay Jennings, and the Bishop Michael Curry. They spoke on the mosquito bite of mission, how the time for youth to lead the church is today, and how the best thing to do is GO. The theme of the “Five Marks of Mission” was further discussed by our plenary speakers – the Reverend Randy Callender and the Reverend Becca Stevens. Randy tied the theme into our location of his home town of Philadelphia and prepared us for our Friday pilgrimage to historical and religious sites throughout the city. Becca spoke on the healing power of love and her experience as mission as a movement through the Magdalene and Thistle Farms programs. At the end of the five days of EYE, goodbyes were tearfully made. What had begun as a group of strangers had transformed into a community of faith. While some Dioceses returned home, the Diocese of Hawaii headed to St. Luke’s Episcopal Church for 3 days of urban mission. We were joined by the Dioceses of Fond du Lac, Delaware, and Alaska, and divided into groups that did activities like helping with the City Camp program for children, packing food at Philabundance, restoring the local graveyard, and clearing overgrown plants, and painting fences. We also participated in daily worship and created a more intimate community of EYE participants and formed new and lasting friendships that spanned from sea to sea. * Casey Nakamura was a part of the EYE'14 Design/Planning Team and a member of All Saints' Church, Kapa'a. 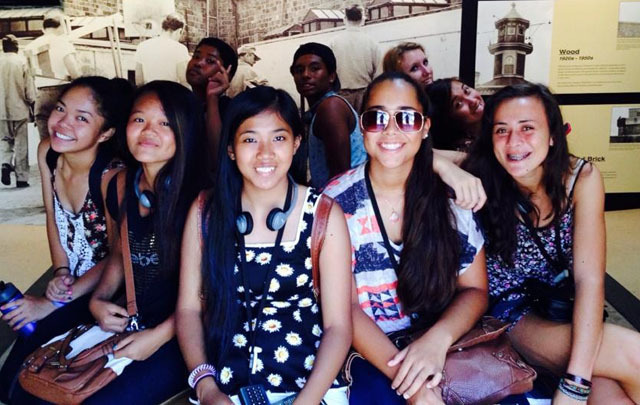 On Saturday, October 25, 2014, at the 46th Annual Meeting of Convention of the Diocese of Hawai'i, about half of the youth delegation shared their experience at EYE'14. The video below was part of the presentation. If you would like information on viewing a hi-resolution copy of this video or for sharing at your congregation, e-mail Communications. EYE'14 video for convention from Sybee on Vimeo. The slideshows below are just a sampling of pictures from the trip. Many more photos can be found on the Diocese of Hawai'i's Facebook page and the Episcopal Youth of Hawai'i Facebook page. I was the only person who represented the Big Island. The others were from Oahu, Maui, and Kauai. I am so blessed to have had an opportunity to go to an event like this because I got to worship with many other Episcopalians in my age group from all around the country and some from other countries as well. During this trip I made a lot of new friends. It was such an amazing experience because everyone at EYE was so nice. You could walk up to a stranger and introduce yourself and you would be able to talk to them as if you knew them your entire life. My favorite thing about this trip was being able to share this amazing opportunity to praise the Lord with other youth that believe in the same thing as me. EYE was so much fun! I hope to get to go to more events like this in the future. I would like to thank everyone who made this trip possible. I'm so glad that I was given the opportunity to go to EYE'14. If I didn't go then I wouldn't have been able to meet a bunch of new people, stay at Villanova, tour Philadelphia, & do mission work. Doing mission work made me realize how lucky I am to have a great support system (aka, my mom) and to live in Hawai'i. Although, it was incredibly humid when we were there I still really enjoyed the trip. EYE was a life changing experience. I was astonished by the friendliness of all the participants of EYE, and was amazed by their love of God and those around them. My favorite part of the trip was the 3-day mission period. This is because I loved knowing that I was helping people that were less fortunate than me, or that I was helping the church that helps people. I realized that it took a lot of people and work to get me there, and I just wanted to thank all the people that helped to get me there and may God bless you. EYE opened my eyes to what God is calling me to do in this world. The genuine people and amazing speakers inspired me! I can't wait to spread my joy and happiness all over Maui! If there was one thing that could describe an absolute good time it'd be over 1,000 Episcopal youth in one giant conga line dancing to Christian music. The people I met at this event were the greatest people I've met in a very long time. My entire experience at EYE was full of people from ALL OVER the United States in a community of no judgement, and just a lot of laughs. Thanks to EYE, I met a lot of new friends from places as far as Wisconsin to Nevada that I still talk to even weeks after the event. There was so much that I learned at EYE that has made me feel like I've grown and matured as a person and I couldn't be happier that I was given the opportunity. I'm also extremely excited that since I'm only going to be a sophomore in high school this coming year, I'll be able to hopefully attend the next EYE event! Also, the food there was BOMB. Three years ago I had the opportunity to attend EYE'11 in Minnesota. I was a freshman in high school when I went on this trip and it changed my life for the better. When I was told I could attend EYE'14 in Philadelphia, PA, I was ecstatic! Even though these were the same events, my age and maturity level made my experiences at each very different. At EYE'14 I took advantage of everything and soaked in as much as I could. I wanted to listen and hear more about others views on things, rather than giving my opinion and hearing myself talk. Talk to anyone and everyone was the goal. If I had a question I wasn't afraid to ask. I was even able to see people I had met at EYE'11 whom I know will be life long friends. I learned a lot more about the Episcopal Church and people through my actions at EYE'14. This was a great experience for me to have before I go to college in a few weeks. I wouldn't have changed it for anything. Thank you so much to everyone who made this trip and event possible! EYE'14 has been such an amazing experience. I got to meet amazing people and see how people from opposite ends of the world can come together through love for one God. EYE was something I thought I could predict. I thought it was going to be long days filled with lots of work and hanging out with only our Diocese. I thought I knew what to expect, but I was totally wrong. I'm a shy person when it comes to meeting new people and I never thought I would form a lot of the friendships I have now because of this trip. I came out of my shell and opened up all because of the power of this trip. It was truly an eye-opening and amazing experience. I'm thankful for the community service I did for this church and this community. Meeting new people and the compliments about Hawai'i was one of my favorite things throughout the trip. To read a report made to the Pacific Islander Committee by chaperone Viliami Lino, visit the webpage HERE.